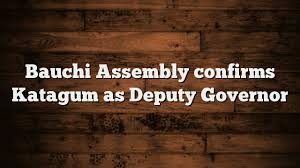 Bauchi Assembly confirms Audu Katagum as Deputy Governor – Royal Times of Nigeria. The Bauchi State House of Assembly on Friday screened and confirmed Alhaji Audu Katagum as Deputy Governor of the state. APC Supporters on the Street of Bauchi to Welcome President Buhari on his day one of his Working Visit to Bauchi State. The member representing Bura constituency, Abdullahi Abdulkadir, moved a motion that the nominee be cleared because he had served the state as a Chief of Staff to the incumbent governor, Mohammed Abubakar. The motion was seconded by Ibrahim Katagum, representing Katagum constituency. The House subsequently confirmed the nominee as Deputy Governor of Bauchi State. The former Deputy Governor, Alhaji Nuhu Gidado resigned his position on May 24. The governor had in June nominated his Chief of Staff, Katagum for confirmation as the Deputy Governor to the House of Assembly.